The other day I wanted to cook dinner for the family but frankly I was just too lazy to go to the store to buy ingredients. So I took a quick inventory of what I had in the house… Chicken. Onions. Cheddar Cheese. Salsa. Lime. Tequila. Whoa, wait a second! Chicken, salsa, lime, tequila? Fajitas! But, I didn’t have any tortillas… bummer. However, I did have Bisquick, so why not do a casserole? Perfect. 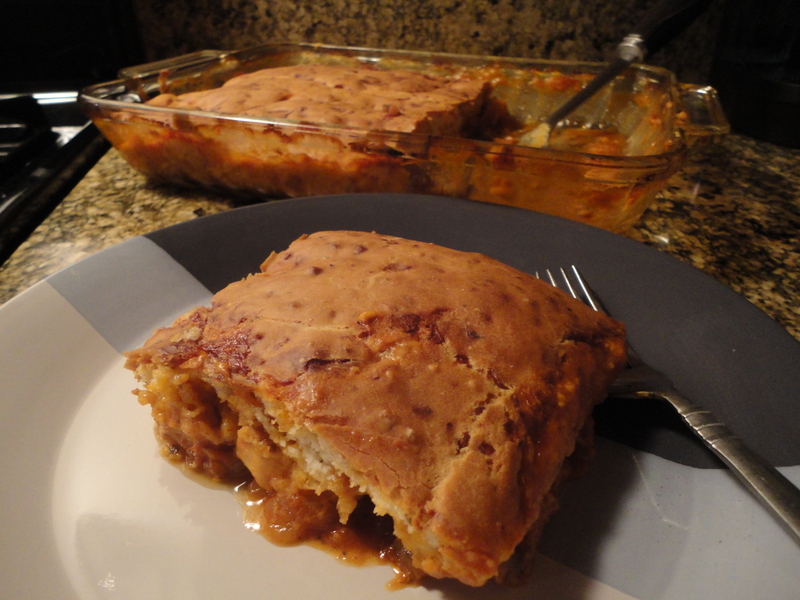 Ok, so maybe it’s not the best looking picture I’ve ever taken, but trust me the casserole is pretty damn good! Super easy to make and full of flavor… you can’t go wrong. In a sealable bag combine the chicken, olive oil, salt, cilantro, crushed red pepper, black pepper, onion powder, paprika and cumin, shake until the chicken is evenly coated. Heat a sauté pan at medium high, add the sliced onion and seasoned chicken, cook until the outsides are very lightly browned. Increase the heat to high and add the tequila and lime juice, reduce by half. Turn off the heat and stir in the salsa. Pour the chicken & salsa mixture into a 9×13″ baking dish, and evenly coat with the 8oz of shredded cheddar. In a large bowl whisk together the Bisquick, milk, dried cilantro and 4oz shredded cheddar until smooth, then pour the batter over the casserole filling, using a flat rubber spatula to spread it evenly. Bake at 375F for 40-45 minutes, until the top is a golden brown. Allow to cool for 10 minutes before serving. There you have it, a simple and delicious dish that can serve the entire family! Tags: baking, casserole, chicken, cooking, easy recipes, fajita, food, perfect pairings, perfect pairings at home, salsa. Bookmark the permalink. That looks great. Now I’m hungry.